Fast RAM for it's price and it looks pretty good with that stealthy heat spreader. It's memory. Runs stable @ 3000MHz as rated in 4x4GB config. from completed build Price to Performance Powerhouse! Bought it for around $68.99 on Amazon. Nothing to complain about. Good memory, gets its job done. Planning on upgrading to 16gb in the future with 2 more of these sticks. It's fast, it's low, it makes your PC go. Anything over 2400 wasn't useful in this build but the price was right on this pack so I went for it. Low profile is a huge benefit here and Vengeance LPX is tried and true. Runs flawlessly. from completed build [Updated] Ditch the laptop dad! It's RAM, I've had no problems with it so far. I haven't overclocked it yet though. Update: I easily overclocked it to 2933MHz @ 1.2V with 15-17-17-35 timings on my Ryzen B350 motherboard! No crashes after three 4-hour runs of Prime95 (see the latest update of my build for more details). 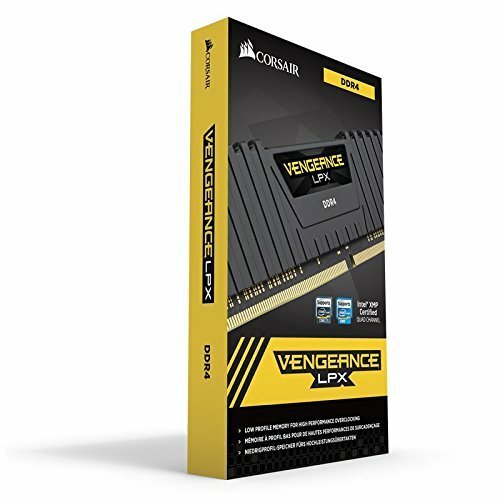 While 8GB is on the verge to a bare minimum today, the memory itself is really high quality as to be expected from Corsair. Had no problems running them at even higher frequencies than they're rated for. Really solid memory that runs at full speed without issue. Definitely worth it if you're in the situation I was in where the 2400 MHz equivalent is somehow $5 more expensive from the same vendor. I also really like the aesthetics of low profile memory over the bulkier stuff, so it has that going for it.